The Dow surrendered the earlier 59-pt gain to end 100 points lower at 11766, mainly due to the fall in financials after investors worried that Basel III capital requirements would provide another blow to the industry. Sentiment was also jolted by ECB’s President cited substantial risks to the economy and said the ECB can’t step up government bond purchases under its founding piece of legislation. Meanwhile, European finance ministers failed to agree on raising the joint ceiling for the European Stability Mechanism and European Financial Stability Facility. 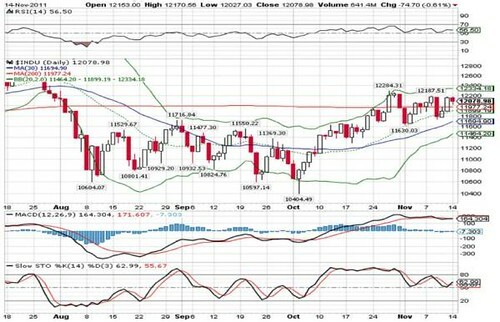 The Dow Jones had retreated 4.2% to end at 11766 from its recent high of 12284 (27 Oct). The fall was driven by the persistent deadlock in Euro debts crisis management and an uncompromised plan and fears of potential en-mass bonds rating downgrades by credit rating agencies, overshadowing the gradual progresses in the recent US economic data. 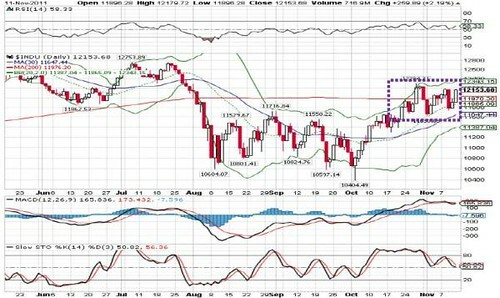 Following the breakdown of 200-d SMA (11936), mid Bollinger band (11831) and 50-d SMA (11821) supports coupled with the negative technical readings, the Dow may retest lower uptrend line and 100-d SMA supports near 11500. 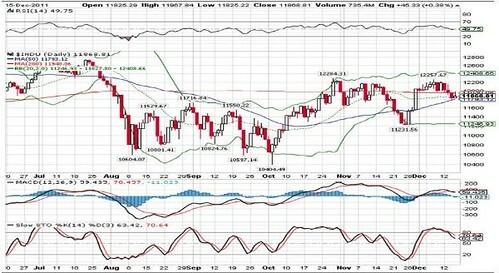 A violation of 11500 will push index lower towards a more solid support of lower Bollinger band at 11250. Immediate resistance levels are 11936-12284 levels. Bucking the downtrend, FBM KLCI jumped 11.6 points to 1477.8, spurred by window dressing activities on selected index-linked counters such as AXIATA (+14 sen to RM5.00), DIGI (+8 sen to RM3.70), GENTING (+16 sen to RM10.54), YTL (+8 sen to RM1.54) and CIMB (+5 sen to RM7.05). 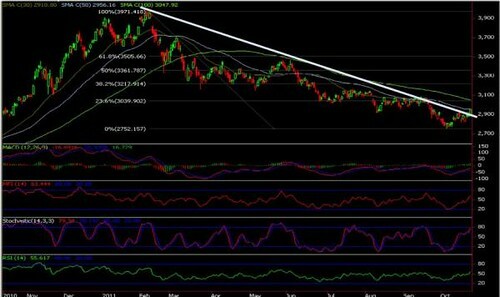 Technical readings have turned better following yesterday 11.6 points gain to stage a strong breakout above the downtrend line. However, given the persistent negative headlines from Europe and thin volume ahead of the year-end holidays, we expect the local bourse to remain volatile albeit with an upward bias due to the window dressing activities. 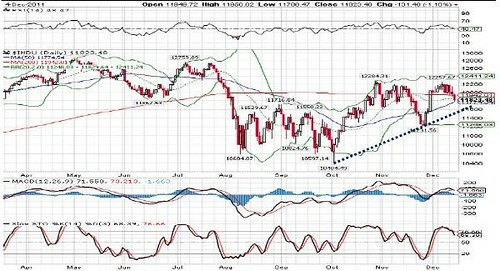 Immediate crucial support is the 50-d SMA or uptrend line (1458), followed by last week’s low at 1448. 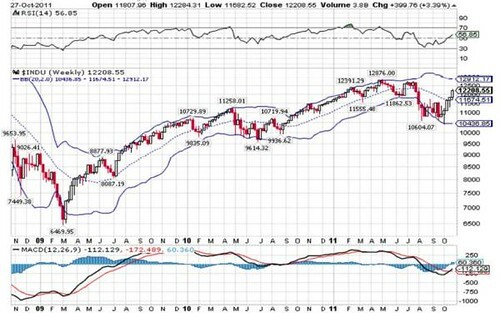 A breakdown of 1448 would mean that the rally from 1311 low (Sep 26) is likely exhausted and will head toward lower Bollinger band (1428). 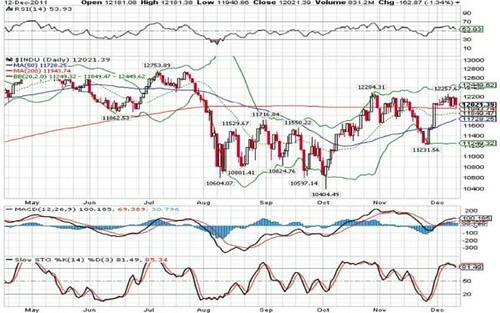 Resistance levels are 38.2% FR (1487) and 200-d SMA (1502). The Dow Jones jumped as much as 99pts buoyed by recent positive economic data and an easing inflation in November that could create room for Fed stimulus in 2012. However, the gains evaporated after Fitch put 7 Europe countries (i.e. France, Belgium, Spain, Slovenia, Italy, Ireland and Cyprus) on credit watch negative, citing the higher probability that it could downgrade these nations in the next few months. The sell-off was also driven by the "quadruple-witching”. In the wake of the US better-than-expected weekly jobless claims and December Philly Fed manufacturing reports, Asian markets rose, discounted concern over Europe’s debt crisis and Fitch’s downgrade of 5 major European groups. KLCI also inched up 2.1 pts to record a 6.1 pts weekly gain, supported by PBBANK (+22 sen to RM13.02), CIMB (+8 sen to RM7.00), PETCHEM (+8 sen to RM6.16), YTL (+5 sen to RM1.46) and PPB (+36 sen to RM16.76). For the next two weeks, Bursa Malaysia’s trading volume is expected to be low, with many market players taking time off ahead of the holidays, as low trading volume tends to exaggerate swings in the market. 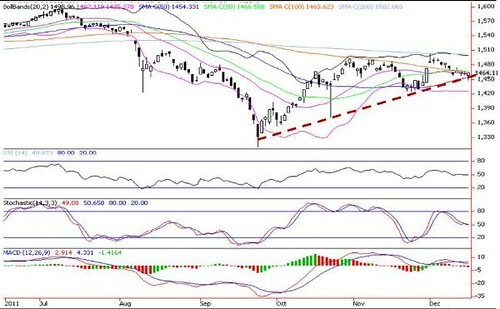 Despite external volatility, we remain cautiously optimistic that the KLCI is likely to offer some counterbalance to the uncertainty in Europe and advocate the strategy of buy on weakness and take profits in any rebound, in anticipation of year-end window dressing activities, potential Chinese New Year and pre-election rallies as well as sufficient domestic catalysts and fiscal stimuli that will support a modest economic growth in 2012. 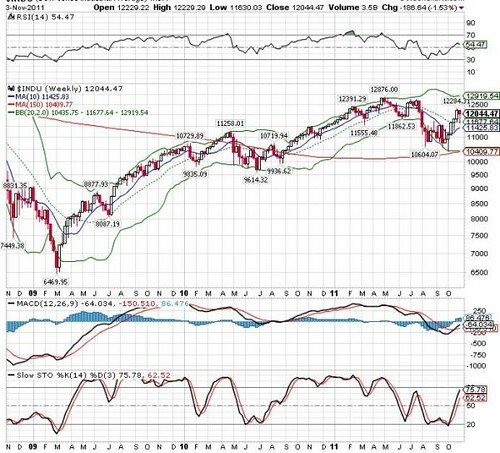 Immediate crucial support is the 50-d SMA or uptrend line (1456), followed by last week’s low at 1448. 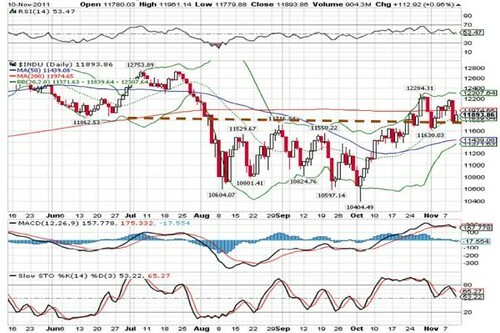 A breakdown of 1448 would mean that the rally from 1311 low (Sep 26) is likely exhausted and will head toward lower Bollinger band (1425) and 61.8% FR (1420) supports. 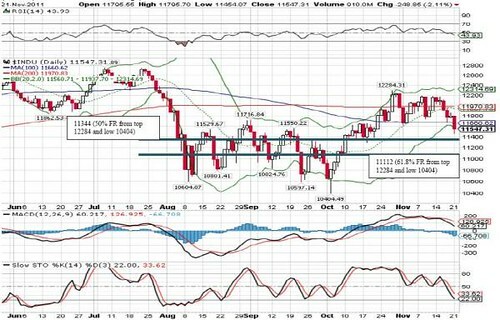 Resistance levels are 10-d SMA (1471), 38.2% FR (1487) and 200-d SMA (1502). After plunging 361 points in last three days, the Dow staged a technical rebound to as high as 144 points before ending only +45 points at 11867 on profit- taking. The improvement was mainly due to a better-than-expected weekly jobless claims and Dec Philly Fed manufacturing reports which overshadowed concern over Europe’s debt crisis and Fitch’s downgrade of 5 major European groups. and growing demand for safe havens. 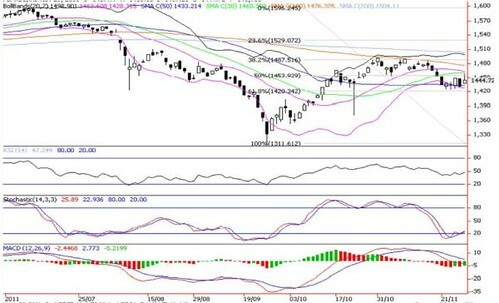 After rebounding from 25 November low of 11232 points, the Dow surged to as high as 12266 on 7 December before retreating lower to close at 11823 yesterday, below the 200-d SMA of 11942 points. 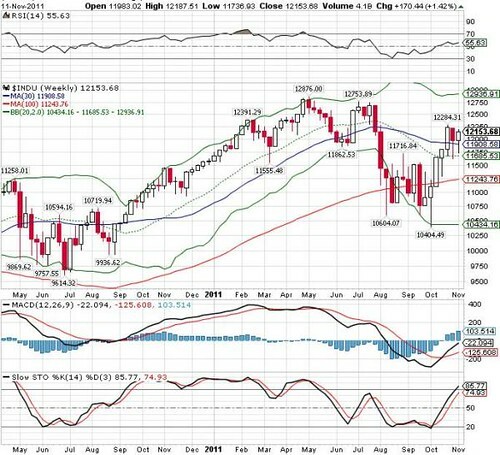 Following the breakdown of 200-d SMA and mid Bollinger band (11829) as well as the weakening technical outlook, downside risks of Dow Jones has increased. 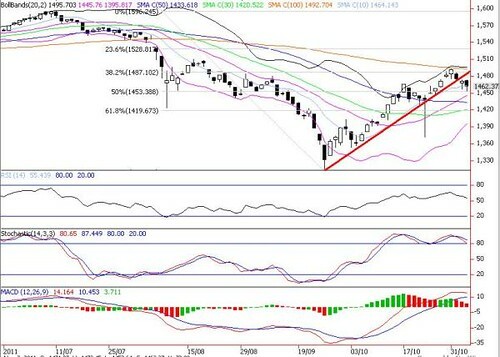 Further supports are 11774 (50-d SMA and uptrend line support near 11600. 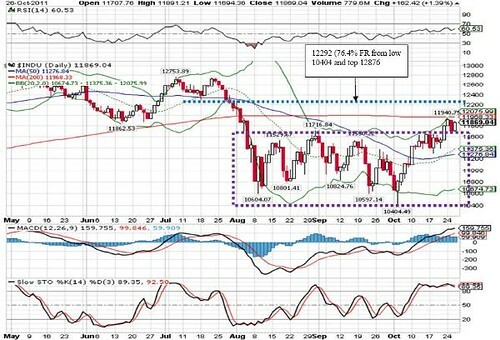 Immediate resistance levels are 11942, 12000 and 12266 levels. 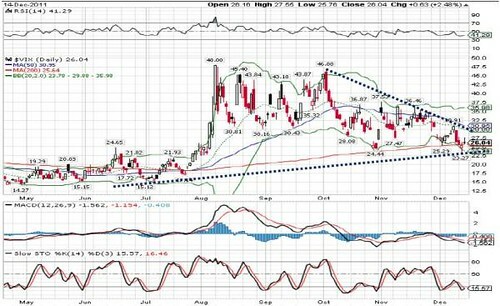 The European euphoria was short-lived as investors fear resumed this week given the VIX, also known as the "fear indicator, rose from recent low of 23.3 to end at 26.0 yesterday, above the long term uptrend of 200-d SMA at 25.6. 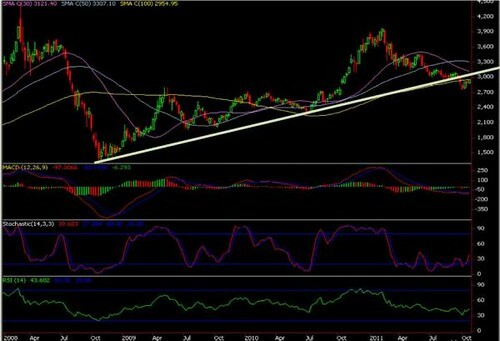 In view of the grossly oversold indicators, we may witness possible technical rebound in the coming days amid rising external woes. 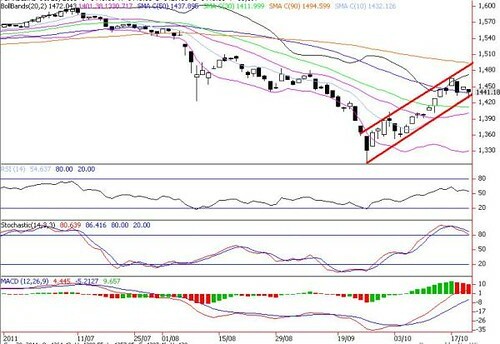 A breakout above the downtrend channel near 30 will likely to prompt more upside towards 35.0-36.0 territory, triggering an alarm bell to Dow and global equity markets. Immediate supports are 23.3 and 20.0. The Dow Jones slid for a third day and hit its lowest level in two weeks amid widespread risk aversion that sent commodity prices tumbling, drove the euro to its lowest in a year and forced Italy to pay a euro-era high to sell debt. The Italian sovereign debt auction saw the euro zone's 3rd largest economy pay a euro era record yield of 6.47% to sell five year paper, following the EU summit that tried to move towards greater fiscal integration last week. Regional markets continued its downtrend as the Eurozone debt crisis, fear of more credit downgrades and no fresh pledges from Fed on further stimulus kept investors on the sidelines. Mirroring regional markets’ pessimism, KLCI was 2.3 pts lower at 1463.1, driven by losses in GENTING (-22 sen to RM10.42), KLK (-50 sen to RM22.60), AMMB (-10 sen to RM5.76), GENM (-5 sen to RM3.85) and IOICORP (-3 sen to RM5.09). Ongoing doubt over the euro-zone debt crisis and prospect of mass euro zone sovereign rating downgrades should continue to dampen investors’ sentiment and encourage wild swings in the financial markets. 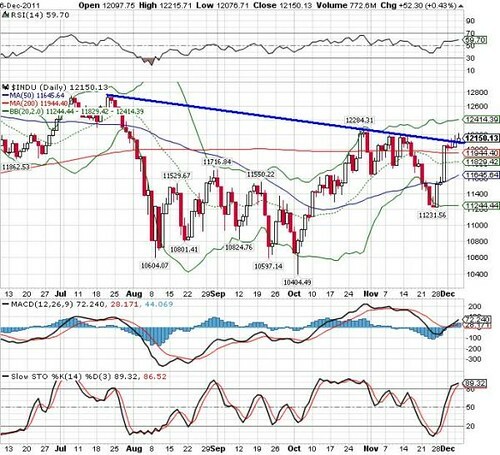 Immediate crucial support is the 50-d SMA or uptrend line (1450). A breakdown below 1450 would mean that the rally from 1311 low (September 26) is likely exhausted and will head toward lower Bollinger band (1426) and 61.8% FR (1420) supports. 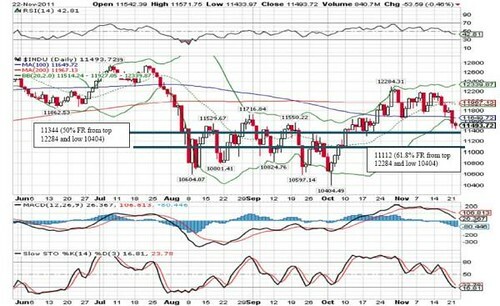 Resistance levels are 10-d SMA (1476), 38.2% FR (1487) and 200-d SMA (1502). Against a weak growth in Nov retail sales, the Dow Jones jumped as much as 126 points following a better-than-expected Spain bonds auctions and Germany investor confidence report. However, the Dow Jones cancelled all gains and dropped 66 points to end below 12k after German Chancellor Angela Merkel again rejected any increases in the bailout fund for European sovereign debt and the Fed delivered little hope that it would turn on the easing spigots anytime soon. Regional markets fell given that investor’s sentiment remained jittery as the Eurozone debt crisis and fear of credit downgrades in that region kept investors on the sidelines. Sentiment was also cautious ahead of the release of U.S. Nov retail sales report and FOMC meeting outcome tonight. 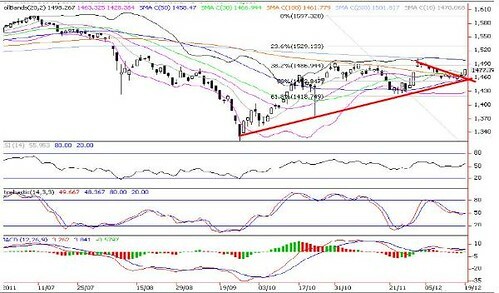 Mirroring regional markets’ pessimism, KLCI lost as much as 9.8 points before narrowing its losses to -1.7 points at 1465.4.
potential Chinese New Year and pre-election rallies as well as sufficient domestic catalysts and fiscal stimuli that will support a modest economic growth in 2012. 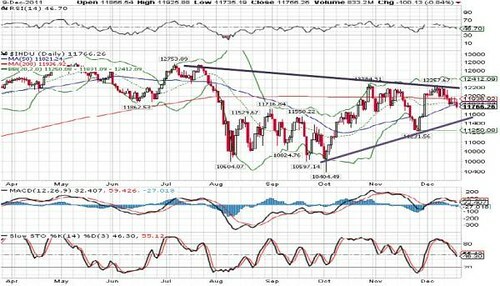 Immediate crucial support is the 50-d SMA or uptrend line at 1450. 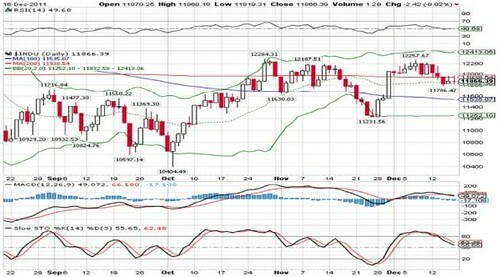 A breakdown below 1450 would mean that the rally from 1311 low (September 26) is likely exhausted and will head toward lower Bollinger band (1426). 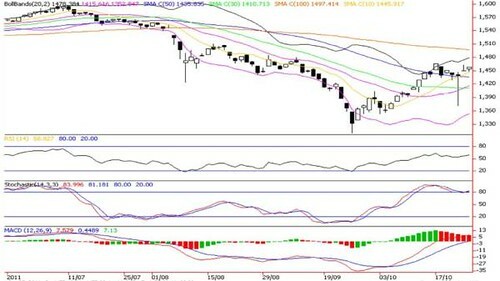 Resistance levels are 10-d SMA (1476), 38.2% FR (1487) and 200-d SMA (1502). Euro-area finance ministers agreed to extend the capacity of the European Financial Stability Fund (EFSF) by “introducing sovereign bond practical risk participation and a co-investment approach,” the EFSF said. The EFSF has a current lending capacity of €440 billion. The EFSF should be able to leverage its own resources of up to €250 billion. “Under the partial-risk protection, EFSF would provide a partial protection certificate to a newly issued bond of a member state,” the statement cites Klaus Regling, EFSF chief executive officer, as saying. The Philippines kept its benchmark interest rate unchanged for a fifth meeting as persistent inflation prevented the central bank from joining Indonesia and Thailand in cutting borrowing costs to bolster growth. Bangko Sentral ng Pilipinas kept the rate it pays lenders for overnight deposits at 4.5%. The decision was predicted by 14 of 17 economists in a survey. US stocks declined as better-than-forecast manufacturing growth and a rally in French and Spanish bonds were not enough to extend the biggest three-day gain in the Standard & Poor’s 500 Index since March 2009. The S&P 500 slid 0.2% to 1,244.58. The Dow Jones Industrial Average decreased 25.65 points (-0.2%) to 12,020.03. Buying momentum on Malaysian Government Securities (MGS) improved during the week under review, on the back of a stronger Ringgit and improved risk appetite along regional stock and debt markets. Gains were recorded mostly along the front and bellies of the yield curve with the 3-, 5- and 7-year benchmark yields falling by 9, 6 and 4 basis points week-on-week (WoW) respectively to 3.05%, 3.24% and 3.54%. Meanwhile, the 10-year benchmark MGS yield fell by 1 basis point WoW to 3.74%. For the 5-year MGS reopening auction, the RM3.0 billion auction garnered rather mild interest, with a bid to cover ratio of 1.78x at an average yield of 3.303%. Of note, the foreign holdings of Ringgit-denominated MGS climbed higher in October at RM94 billion (34% of the outstanding MGS) after some unwinding of positions in September. For Private Debt Securities (PDS) market, trading was largely focused on AA-rated papers, and followed by AAA-rated papers. Banking and power sectors remained as investor’s top pick. Local government bond market will continue to take hints from the development in the Eurozone and the US Treasuries in charting its direction. On economic front, despite the expectation of a moderating growth prospect in Malaysia for the last quarter of the year, the Economic Transformation Programme and a healthy domestic spending, should help to achieve the projected 5-6% Gross Domestic Product (GDP) growth for 2011. As for the final government bond auction for this year, we believe the 3-year Government Investment Issues (GII) reopening auction should be well received. Meanwhile, investors are waiting for the new auction calendar for 2012 to better gauge demand supply dynamics of the government bond segment for next year. We expect corporate bond market to be well supported for the rest of the year and investor may continue to extend duration on tame inflation and stable interest rate outlook. It was a good week for equity as the concerted effort by several central banks to slash the penalty rate on dollar liquidity generated positive sentiment. 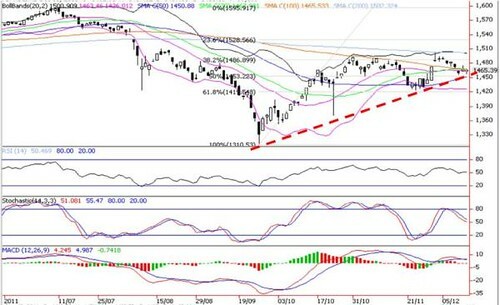 It managed to break the 1,500 points on Thursday before tapering off to 1,489 points as investors accumulate blues that have strong fundamental. For the week, the FBM KLCI jumped 57 points or 4% to 1,489points and briefly broke through the 1,500 points level before easing back. The FBMKLCI underperformed the region for the first time in five weeks as up to Thursday the index was up 3.8% against the steeper 8.7% surge by the MSCI FExJ. Average daily trading value for the week rose 54% to RM1.75 billion (RM1.14 billion previously), which was 11% above the three-month average of RM1.57 billion. We believe the market still has strength to move further underpinned by policy respond and seasonality. In the short term, we expect the market continue to consolidate with upward bias as investors position themselves for year end window dressing. 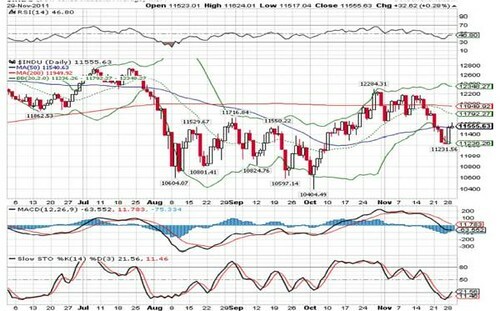 On the downside, the market immediate support is at 30 days smooth moving average (SMA) situated at 1,464 points. Dow Jones soared as much as 118 points intraday amid a report that EU officials may be creating two separate rescue funds to help contain the region's ongoing sovereign debt crisis. Negotiators are considering allowing the existing €400 billion European Financial Stability Facility (ESTF) fund to continue running when a new €500 billion facility known as the European Stability Mechanism (ESM) comes into force in mid-2012. Nevertheless, the early gains were cut to 52 points as S&P said it is considering downgrading the EFSF. Asian markets fell after S&P warned it might downgrade euro zone countries en masse if the EU summit on Dec 8-9 fails to produce a credible plan to solve the region's debt crisis. The warning brought to a halt a rally in global equities that began last week, spurred by the world's six major central banks moved to tame potential liquidity crunch for European banks by providing cheaper dollar funding, along with monetary easing in China. Tracking regional losses, KLCI closed 9 points lower at 1480.9, driven by losses in CIMB (-12 sen to RM7.09), MAYBANK (-9 sen to RM8.20), TENAGA (-7 sen to RM5.65), GENTING (-10 sen to RM10.82) and AXIATA (-4 sen to RM4.95). Ahead of the EU summit and the S&P’s downgrade warnings on euro zone countries en masse, the local bourse will waver for the rest of this week. 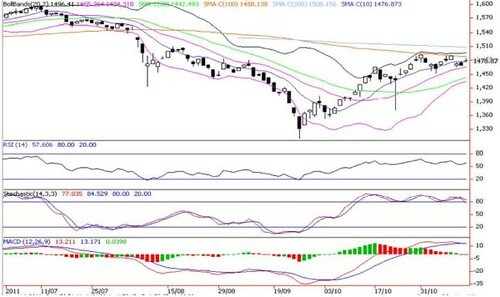 Technically, KLCI is looking lethargic after the 9 points fall yesterday, with crucial supports at the mid Bollinger band (which is also the 20-days SMA at 1465) and 100-day SMA (1471) levels. 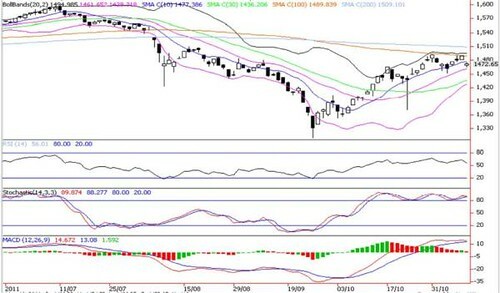 A breakdown below 1465 support will accelerate more selling pressures towards 50-d SMA (1440) and recent low of 1423 (November 23). 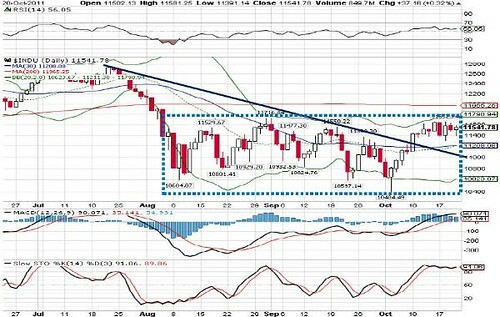 Immediate resistance remains at 200-d SMA (1503). Axiata recorded a strong subscriber growth of 26% yoy reaching 186.9m customers despite softening key markets. Revenue growth continues to be driven by significant increase in data particularly at XL and Celcom with YTD growth of 50% and 29% respectively. Celcom subscriber base declined to 11.4m (2.7m postpaid and 8.7m prepaid) due to rationalization of multi-SIM user and we think this is the reason that ARPUs are elevated (postpaid +RM3 to RM95 while prepaid +RM1 to RM37). Meanwhile, MoU broke its down trend and came in higher +6% qoq at 210mins thanks to the festive season in 3Q. Wireless broadband contributed RM197m with +6% qoq on the back of 924k subscribers. Smartphone penetration is 15%. XL successfully gained momentum and acquisition through new offerings with 12% subscribers increase qoq reaching 43.4m. Prepaid ARPU stagnated at IDR31k while postpaid plunged to IDR171k or declined -17% qoq even though 3Q should have the benefit of festive season. XL explained that lower outgoing MoU is due to shifting in subscribers’ behavior from voice to SMS and data usage. Smartphone penetration is 11%. Dialog recoded a healthy growth in revenue mainly contributed by mobile, TV and infra businesses. ARPU increase 8% qoq driven by increase take up of premium VAS products. MoU growth mainly by prepaid due to increase in affordability. Robi qoq revenue growth attributed mainly to VAS including data services and interconnect business. PAT decreased qoq by FOREX loss and accelerated depreciation on old swapped equipment due to network modernization. Updated with latest guidance on higher CAPEX and depreciation along with tweaking lower our assumptions of subscriber base and ARPU. Our FY11-FY13 EPS are revised lower by -9.0% to -10.7%. We keep our HOLD call as we cut out target price by 9% to RM4.92 from RM5.44. We opine that the robust growth story may have come to an end especially for Celcom and XL who are the main contributors as market matures and competition intensifies. After spiking 4.2% on November 30, Dow Jones drifted 26 points lower to 12020 overnight amid an unexpected rise in weekly jobless claims and ahead of the crucial Oct job data tonight. However, overall sentiment remained firm in the wake of the stronger-than-expected Nov ISM and Oct construction spending figures. Despite easing China’s Nov PMI to 49 from 50.4 in October, Asian markets surged after the world's six major central banks moved to tame a liquidity crunch for European banks by providing cheaper dollar funding, along with monetary easing in China. Tracking the strong Asian markets, FBM KLCI closed 13.2 points higher at 1485.3, off intra-day high of 1,502.5 (+30.4 points). Leading movers were IOICORP (+17 sen to RM5.18), PBBANK (+20 sen to RM12.74), PETCHEM (+18 sen to RM6.17), MAYBANK (+9 sen to RM8.39) and DIGI (+8 sen to RM3.60). 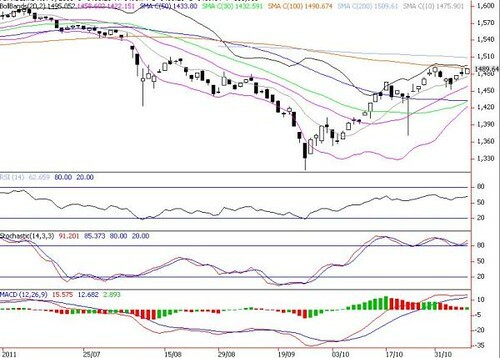 On the backdrop of a 3-day 54 points jump and a gravestone Doji formation yesterday, KLCI is likely to encounter more profit taking activities ahead but any selling pressures are likely to be well-absorbed as technical indicators remain positive. As long as the KLCI is able to maintain its posture above the uptrend line support near 1440 points, we remain short term positive on KLCI. Immediate resistance remain at 200-d SMA (now at 1504) whilst supports are situated at 100-d SMA (1474 points), 1463 (mid Bollinger band) and 50% FR (1454). Germany said European Union leaders will not provide the complete fix to the Euro area debt crisis that global policy makers are pushing for at an October 23 summit. German Chancellor Angela Merkel has made it clear that “dreams that are taking hold again now that with this package everything will be solved and everything will be over on Monday won’t be able to be fulfilled,” Steffen Seibert, Merkel’s chief spokesman, said. The search for an end to the crisis “surely extends well into next year.” Group of 20 finance ministers and central bankers concluded weekend talks in Paris endorsing parts of Europe’s emerging plan to avoid a Greek default, bolster banks and curb contagion, setting the October 23 meeting of European leaders in Brussels as the deadline. Brazil’s central bank cut borrowing costs by half a point for a second straight meeting, as growth in Latin America’s biggest economy slows amid Europe’s sovereign-debt crisis. The bank’s board, led by President Alexandre Tombini, voted unanimously to reduce the benchmark Selic rate to 11.5% from 12%, as forecast by 61 of 68 analysts in a survey. Five analysts forecast a 0.75-point reduction, and two expected a full-point cut. Thailand kept interest rates unchanged for the first time this year, ending its longest series of increases since 2006, as the nation’s worst floods in five decades and a weakening global economy crimped growth. The Bank of Thailand kept its benchmark one-day bond repurchase rate at 3.5%, a decision predicted by 16 of 17 economists in a survey. The Malaysian Government Securities (MGS) market was lackluster during the week under review due to lack of fresh drivers and hence, benchmark yields were range-bound. The 5- and 7-year benchmark MGS yields climbed 3 basis points (bps) and 1 bp weekon-week (WoW) respectively to 3.35% and 3.52%. The 3-year MGS yield was traded the most amongst the benchmark and remained unchanged at 3.15%. The 10-year MGS yield also remained stable at 3.71%. On local economic front, the Consumer Price Index (CPI) surprisingly rose at a faster pace of 3.4% year-on-year (YoY) in September 2011, from 3.3% in August 2011. This was due to a faster increase in food and transportation costs, whilst a weakening ringgit of about 7% against the dollar in September caused import costs to be higher. In addition, Leading Index (LI) moderated to 1.1% YoY in August 2011, from 1.9% in June and July 2011, pointing to weaker economic activities ahead. For Private Debt Securities (PDS) market, trading interest continued to focus on AAA- and AA- segments, which are mainly banks, plantation and power sectors as well as quasi-government entities. Amid ongoing debates and speculations on final outcome of the Eurozone debt crisis, local economic data continued to point to moderating growth prospect despite the recent higher than expected inflation numbers. We maintain our view that Bank Negara Malaysia (BNM) will likely keep interest rates unchanged in the last monetary policy meeting in November this year. Following the announcement of target budget deficit of 4.7% and Gross Domestic Product (GDP) forecast of 5-6% in 2012, market does not seem to be too excited over the seemingly optimistic growth number forecast. Reaction in the bond market was muted despite the improving deficit numbers. We expect government market to continue to be range-bound while market awaits release of the government bond auction calendar for 2012 to gauge the term structure of the government bonds. Meanwhile, news from the Eurozone and the US data will continue to influence the local currency as well as local bond market direction. For credit market, there have been a couple of sizeable new issuances coming to the market recently. Despite all uncertainties clouding the global financial market, these high-grade issuances received strong response from the local market. We reckon this is due to high liquidity in the market, on top of yield requirement. We expect the corporate bond market to continue to be resilient while we acknowledge that valuation is stretched. In addition, we do not discount potential risk-aversion triggered by more adverse news on the economic growth prospects. We have revised our duration call to slightly overweight from neutral duration across all Fixed Income. In terms of asset allocation, focus remains on corporate bonds. We aim to participate in new issuances for further diversification and yield enhancement. 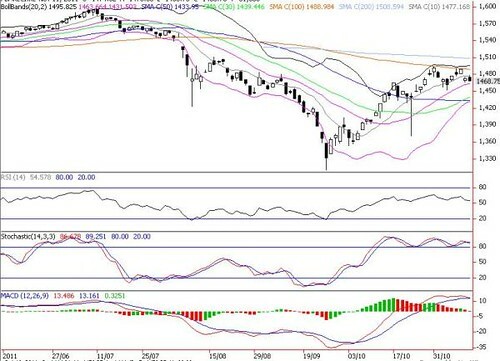 The pullback last week was widely expected as the index had risen substantially for the last three weeks. 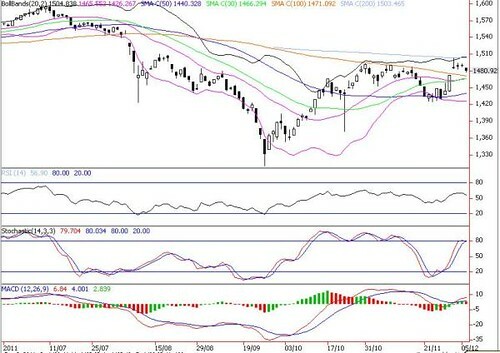 We conclude that the market has found the immediate bottom at 1,330 points and we believe the market will continue to consolidate before staging another rebound as both the Moving Average Convergence Divergence (MACD) and signal lines are crossing over into the positive region. In other words, the buying momentum is still intact with minimum downside risk. 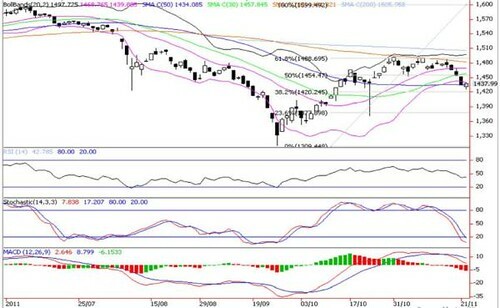 For the week, the market fell 3.6 points or 0.25% to close at 1,438.83 points. 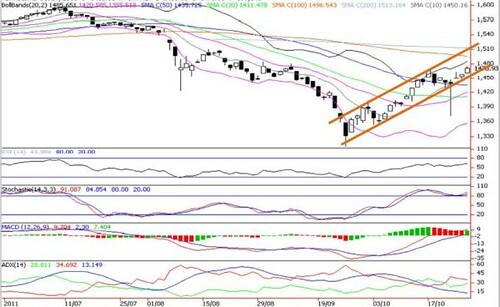 In the short term, the index should resume its uptrend towards the resistance of 1,453 – 1,473 points. 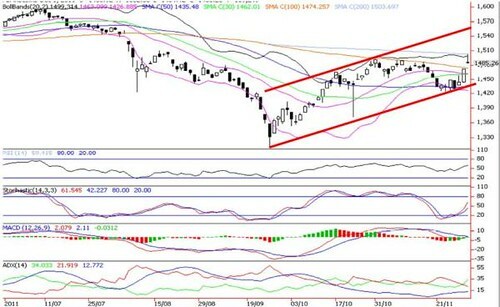 The market needs positive catalysts to move above the resistance trend lines and if that happens, we might see the index crossing 1,500 points, a key psychological level. In order to capitalize on the uptrend, we see construction, banks, plantation and property as the best proxies. 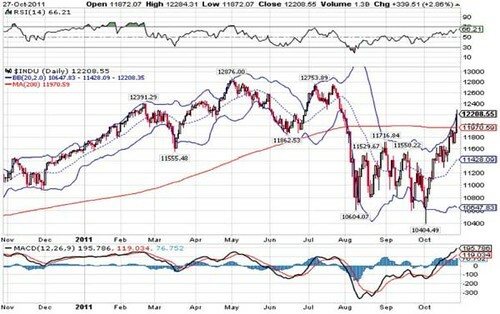 On the downside, the market is well supported at 1,420 points which is the 50-day Smooth Moving Average (SMA). Tracking the buoyant gains in the Asian and Europe markets, Dow soared 340 pts or 2.9% at 12209, its highest close since July 28. US Treasuries and dollar slid while commodities jumped as investors cheered a marathon EU summit meeting that hammered out a commitment by banks and other private bondholders to accept a voluntary 50% writedown on Greek government debt, a boost in the lending power of the European Financial Stability Fund (EFSF) to 1.0trn euro and a 106bn euro recapitalization of European banks. Sentiment was also boosted by a stronger 3Q11 GDP of 2.5% (2Q11: 1.3%). Asian markets jumped after EU leaders agreed to boost the region's rescue fund and struck a deal on a 50% writedown for private bondholders on their Greek debt. Tracking the regional uptrend, FBM KLCI rose 13.1 points to 1470.9, the highest since 2 Sep, led by GENTING (+31 sen to RM10.30), IOICORP (+16 sen to RM5.26), PBBANK (+14 sen to RM12.62), GAM (+20 sen to RM3.37) and PETCHEM (+12 sen to RM6.31). Trading volume increased to 1.88bn shares worth RM2.4bn against Tuesday’s 951m shares worth RM1.08bn. 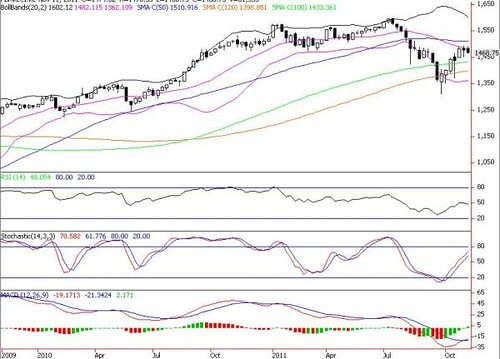 Riding on the overnight bullish Wall St and Europe markets, FBM KLCI is expected to continue its uptrend towards 1500 psychological barrier and probably to retest the 200-d SMA (now at 1513) after a mild profit taking consolidation. As the EU debt deal is perceived as offering more of a breathing space that gives policy makers a window of opportunity to put its house in order but it lacks any strategy to boost growth in the euro zone, where countries have been encouraged to emphasize austerity in an effort to bring down debt levels. Hence, if the euro-zone economy weakens materially, the debt dynamics will get worse and could throw the program off course. Immediate resistance is upper Bollinger band (now at 1487), followed by 1496 (100-d SMA) and 1500 levels whilst immediate supports are 10-d SMA (1450) and 50-d SMA (1435) points. The Dow Jones rose more than 160 points in the early session following better-than-expected Sept durable goods orders and new home sales, approval by German lawmakers of leveraging the euro zone's emergency bailout fund coupled with Boeing results. 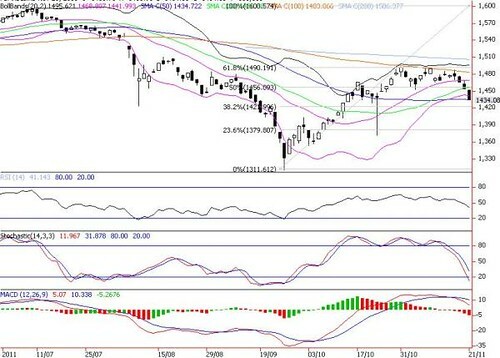 However, the index slipped to negative territory in the afternoon amid uncertainty about the outcome of a key meeting among European leaders until positive news that China would invest in European Financial Stability Facility (EFSF) drove the Dow Jones 162 points higher to close at 11869. # IOI issued a notice to Pertama Land & Development Sdn Bhd (a unit of DutaLand Bhd) to terminate the sale and purchase agreement (SPA) to acquire 11,977.9ha of oil palm plantation land in Sabah for RM830m, due to “noncompliance of certain terms and conditions which had been communicated to Pertama Land”. # According to IOI’s announcement, OSK Trustees Bhd (the stakeholder of DutaLand Bhd) will have to refund IOI the RM83m deposit (10% of the purchase price) and interest accrued. # However, DutaLand, on the other hand, said it does not accept IOI’s reasons for termination of the SPA, and it has notified OSK Trustees not to remit the deposit paid by IOI. # Recall, IOI had on 28 Jul 11 proposed to acquire 11,977.9ha of oil palm plantation land (consisting of 5 estates that are planted with oil palm) in Labuk and Sugut, Sabah for RM830m. Worst case scenario, assuming IOI’s 10% down payment is not refundable, it would reduce IOI’s FY06/12 net profit by 3.5% to RM2,285.8m. However, it is still premature to determine if IOI will lose its deposit given the absence of further details in the announcement. # We are slightly negative on the latest development, as we had earlier expected the acquisition to improve IOI’s FFB yield and output growth over the longer term. # Also, we note that this is the second time IOI walking away from such deal (first time being IOI aborted plan to acquire Menara Citibank in Nov 2008) and this may hurt its share price sentiment arising from the potential loss of deposit. Maintained for now, pending further update from management. Target Price (based on SOP) maintained at RM4.57 for now, and our Hold recommendation for IOI maintained. IOI’s chairman Tan Sri Lee said CPO prices are expected to rise above RM3000/MT in the next three months due to the drop in production amid increasing overseas demand. He added that the rainy season coupled with a labour shortage is expected to derail production of fresh fruit bunches in the medium term in the wake of increasing demand from China, India and Pakistan. 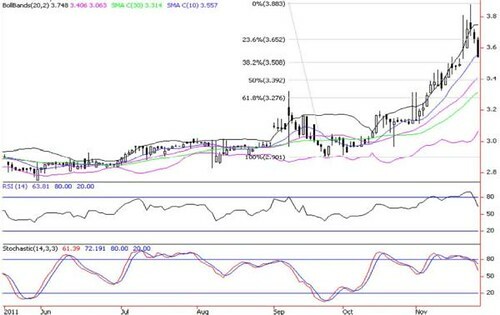 To recap, CPO prices jumped 2.1% to RM2951/MT on 25 Oct and had rebounded 6.5% from 52-wk low of RM2771 on 7 Oct.
After surpassing its 30-d SMA and a breakout of the downtrend line (DTL) from 52-wk high, near term CPO outlook has turned better amid strengthening weekly and daily technical readings. Immediate upside resistance targets are RM3040 (23.6% FR) and RM3217 (38.2% FR) while stiffer resistance is situated near 50% FR at RM3362. 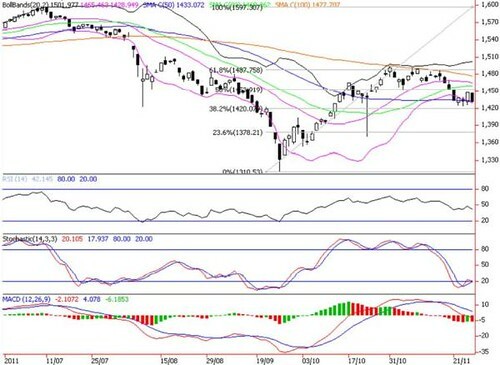 Immediate supports are mid Bollinger band (now at RM2856) and lower Bollinger band of RM2763 levels. Asian markets wavered amid overnight Wall Street losses following a decline in Oct consumer confidence and ahead of the crucial 2nd EU summit on 26 October. However, sentiment improved as Chinese Premier Wen Jiabao said China should "fine tune" its policy at an appropriate time, which investors took to mean monetary policy could become more accommodative. announcement on how Europe plans to stem its debt crisis. While awaiting a more detailed resolutions by Euro finance ministers in Nov (after failing to finalize a master plan yesterday), overnight gains on Dow and news that China will buy bonds issued by the EFSF should bode well for broader markets. 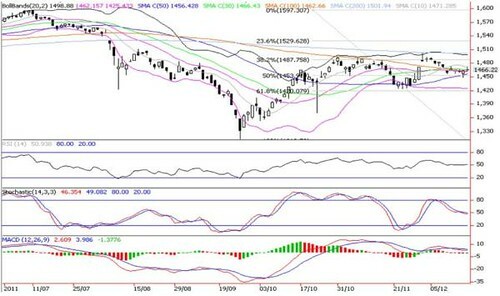 Maintain SELL INTO RALLY or TAKE PROFITS near our envisaged resistance targets of upper Bollinger band (now at 1478 pts) and 100-d SMA (at 1497). 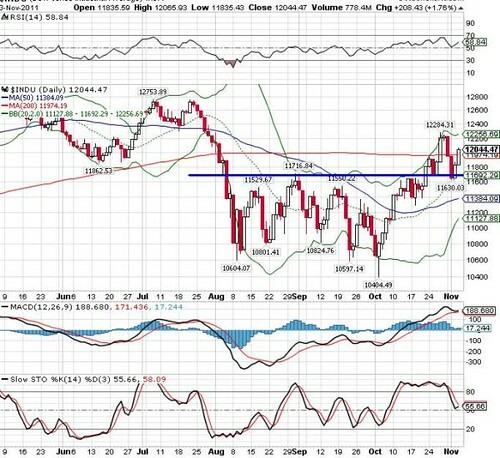 Immediate pullback supports are 1436 (50-d SMA), 1410 (30-d SMA) and the 1400 psychological levels. 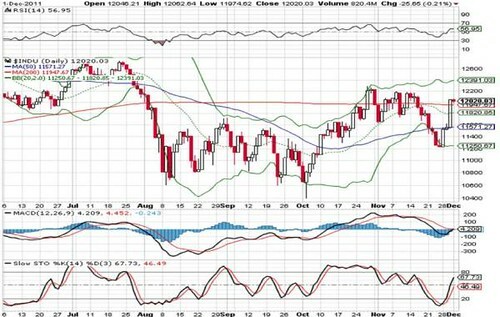 Daily Dow Jones: Consolidating Within The Upper And Mid Bollinger Bands. The Dow Jones was on a rollercoaster ride throughout the session as investors struggled to digest and react to a raft of headlines from the euro zone ahead of the upcoming EU summit on 23 October. In the most recent development, Germany's Merkel and France's Sarkozy said euro zone leaders will approve a plan by 26 October at the latest, as they gear up to hold talks ahead of Sunday's meeting. Meanwhile, a better-than-expected Oct Philadelphia manufacturing index helped lift sentiment. Asian markets were lower on concern about slowing economic growth in China as well as divisions among European leaders over the EU’s weekend summit that could derail real progress in keeping the euro zone debt crisis in check. Tracking regional fears, FBM KLCI tumbled as much as 21 points intraday before paring down its losses to 9.1 points at 1441.2. Lagging movers were AXIATA (-12 sen to RM4.73), GENTING (-12 sen to RM10.00), SIME (-7 sen to RM8.58), PETCHEM (-8 sen to RM6.04) and CIMB (-4 sen to RM7.19). Global markets that are tethered to hopes for a European debt crisis solution is likely to remain volatile and confused in the immediate term, depending on the outcome from the upcoming EU discussions from 23-26 Oct and a later one from G20 on 3-4 Nov. The consensus view is now that it could take months or more for the situation to get resolved. 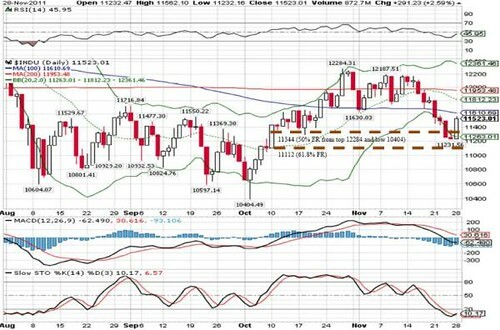 supports for pullbacks are 1432 (10-d SMA), 1411 (30-d SMA) and the 1400 psychological levels.